It was another bad night at the plate for the Red Sox on Wednesday as timely hitting was once again absent. This time they stranded 12 runners and went 1-for-6 with runners in scoring position in a 2-1 loss to the Rangers. 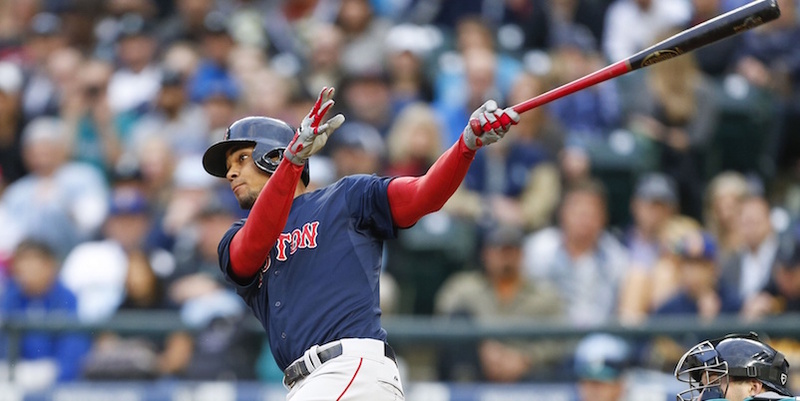 Top Play (WPA): Xander Bogaerts drove in the Sox’s lone run when he crushed a first-pitch slider deep over the left-field wall for a solo home run (.130) to lead off the fifth inning. Bogaerts’ shot came at an important time in which the Red Sox were struggling against Texas starter Phil Klein early on, collecting four hits over the first four innings. Robinson Chirinos led off the third inning with a solo homer of his own (.104) to extend the Rangers’ lead to 2-0, which was enough to outlast the Sox. Bottom Play (WPA): The bottom WPA play is none other than the one that ended the game. David Ortiz was intentionally walked with a runner on second and two outs for the second time in the last three innings. And for the second time, Hanley Ramirez couldn’t drive in the winning run. The left fielder grounded into a fielder’s choice at second base (-.167) to end a frustrating night for the Red Sox. Key Moment: The Red Sox offense was granted few chances by Klein Wednesday night. Their best opportunity came in the bottom of the sixth when they loaded the bases with one out, chasing Klein from the game. But the Sox failed to take advantage. Brock Holt struck out and Bogaerts flied out to center to end the threat and preserve the Rangers’ 2-1 lead. The Sox are now 0 for their last 19 with the bases loaded. Trend to Watch: Mike Napoli, believe it or not, has been the lone bright spot for the Red Sox offensively. After a miserable start to the season, Napoli has showed signs of a turnaround with his second straight two-hit night on Wednesday. Napoli followed Tuesday’s two-hit, two RBI game that included a home run with a pair of singles the next night. He also reached on an error in the sixth. The plane ride home from Seattle may have sparked Napoli’s offensive renaissance. He reportedly watched as Dustin Pedroia broke down film of the first baseman’s at-bats and pointed out flaws in his approach compared to what he’s done in the past. It appears to have paid dividends thus far. Perhaps Pedroia has a job as a hitting coach in his future. Coming Next: The Sox will go for the series win in Thursday’s finale at 7:10 p.m. Clay Buchholz seeks his third-straight quality start as he opposes Texas left-hander Wandy Rodriguez. Buchholz was cheated out of a win by his offense in his last outing Friday in Seattle. He allowed just one run with 11 strikeouts over eight innings in a no-decision. Rodriguez, on the other hand, struggled in his last start, allowing five runs on eight hits over 4.2 innings. But he’s been strong for most of the season, posting a 3.85 FIP in five starts. The Red Sox follow this series with three games at home against the Angels. Ask BP Boston: Will the Red Sox Finish Over .500?